Sprint just announced that it will begin selling Samsung's Galaxy Note II beginning on Oct. 25 for $299.99 with a new two-year contract. The device will launch in marble white or titanium gray and sports a massive 5.5-inch 720p HD Super AMOLED display, Android 4.1.1 Jelly Bean, a quad-core Samsung Exynos processor clocked at 1.6GHz, support for Sprint's 4G LTE network, an 8-megapixel camera capable of recording 1080p HD video, a front-facing camera for video chat and, of course, the S Pen for note taking. We love the Note II — you can read our full review here — so start saving those pennies now. OVERLAND PARK, Kan.–(BUSINESS WIRE)–Sprint (NYSE:S), the only national carrier with Truly UnlimitedSM 4G LTE data, text and calling to any mobile, today announced an availability date for Samsung Galaxy Note® II. Beginning Oct. 25, it can be purchased for $299.99 with a new line or eligible upgrade and two-year service agreement (excludes taxes and surcharges) for either color option – Marble White or Titanium Gray. Manufactured by Samsung Telecommunications America, LLC (Samsung Mobile), the No.1 mobile phone provider in the United States, Galaxy Note II will boast several firsts for Sprint – first to launch with Android™ 4.1.1, Jelly Bean; first smartphone display larger than 5 inches; and first device to launch with a quad-core processor. With the latest HD Super AMOLED™ screen technology powering the device's 5.5-inch 720p display, images are bigger, clearer and brighter than ever. Performance and power are built-in on Galaxy Note II with Samsung's Exynos™ 1.6GHz quad-core processor, a long-lasting battery, blazing fast 4G /LTE network speeds, and international voice and data capable compatibility with GSM/UMTS/CDMA networks. Galaxy Note II comes with a built-in S Pen™ that is longer, thicker and ergonomically designed for the perfect grip. Its advanced features also provide enhanced capabilities to capture ideas and inspirations instantly and to combine handwriting with any digital content directly on the screen. 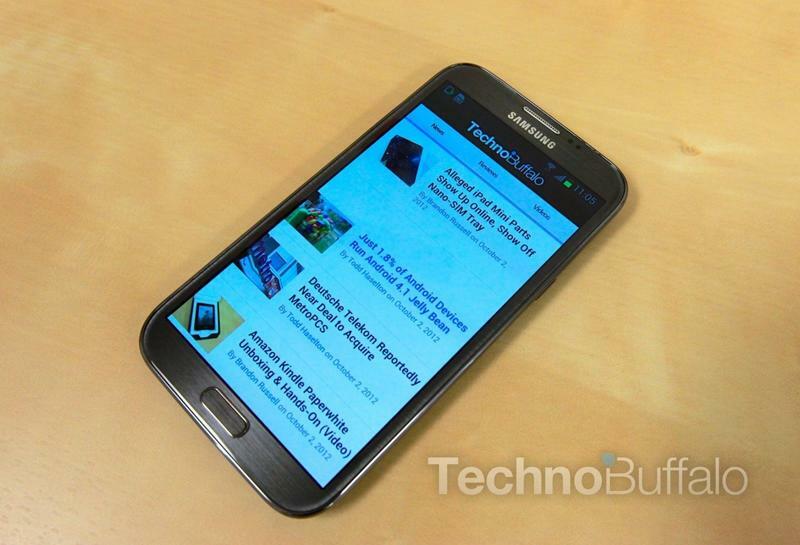 Galaxy Note II features an 8-megapixel rear-facing camera and 1.9-megapixel front-facing camera with HD video recording. The camera's powerful features include Buddy Photo Share, Burst Shot and Best Photo, which were introduced on Galaxy S III in June. Following the same business-friendly path, Galaxy Note II is a SAFE™ (Samsung for Enterprise) device, providing the ability to securely sync corporate email, calendars, contacts and sensitive information. SAFE provides a comprehensive approach to making Android devices more secure and manageable for business users. With a thorough quality assurance process in place to test and confirm the Note II enterprise capabilities, SAFE systematically meets the rapidly evolving needs of IT and the growing number of businesses allowing employees to "bring your own device" (BYOD) to work. Samsung Galaxy Note II customers can enjoy an unlimited data experience with Sprint Everything Data plans. Sprint's Everything Data plan with Any Mobile, AnytimeSM includes unlimited Web, texting and calling to and from any mobile in America while on the Sprint Network, starting at just $79.99 per month for smartphones – a savings of $20 per month versus Verizon's comparable plan with unlimited talk, text and 2GB Web (excludes taxes and surcharges). With Sprint's Everything Data and other plans that include Truly Unlimited data, Sprint is continuing its history of data leadership by making it easy for its customers to use data in all the ways that are useful to them, such as news, email, music, TV and GPS navigation, without worrying about data overages on their monthly bill. Sprint 4G LTE is available in 24 citiesi and is expected to be in more than 100 additional cities in coming months. Sprint introduced its all-new 4G LTE network in July 2012 and expects to have largely completed the nationwide build-out by the end of 2013. For the most up-to-date details on Sprint's 4G LTE portfolio and rollout, visit www.sprint.com/4GLTE. Sprint will host the 12th annual Open Solutions Conference Oct. 24-25 at the San Jose, Calif., Convention Center, offering developers, ecosystem partners and executive attendees an up-close view into the latest app developing tools and capabilities, keynote presentations from Sprint CEO Dan Hesse and other industry leaders, breakout sessions, coding sessions, event sponsor exhibits, and business-critical networking opportunities. Registration is open at http://developer.sprint.com/OSC2012.